As I write this, I am looking at 750 images shot last week during a printmaking excursion in Mazatlán, Mexico. Fluorescent sunsets, brightly colored building facades with ornate iron work, huge burlap sacks of chilis and dried beans, trays of steaming tamales and foamy ocean waves. Oh yes, and monotypes. Scads of them. The prints are overflowing tables, pinned to walls and sitting on the bed of a huge, gorgeous, bright blue Griffin press. How is it that I spent a week in perfect weather, body surfing, exploring ancient petro glyphs on a deserted beach and still managed to come home with a dozen prints that I’m wild about? 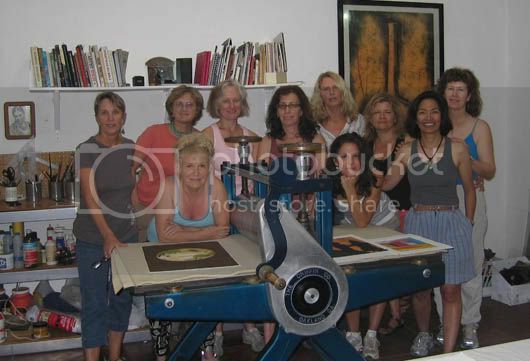 I took a group of printmakers to a workshop at the Mazatlán studio of CSP member and former Bay Area printmaker Glen Rogers. This was my second trip to Glen’s studio. Last year I took a group of seven experienced printmakers, including CSP members Julia Nelson-Gal, Evelyn Klein and Pamela Takigawa. 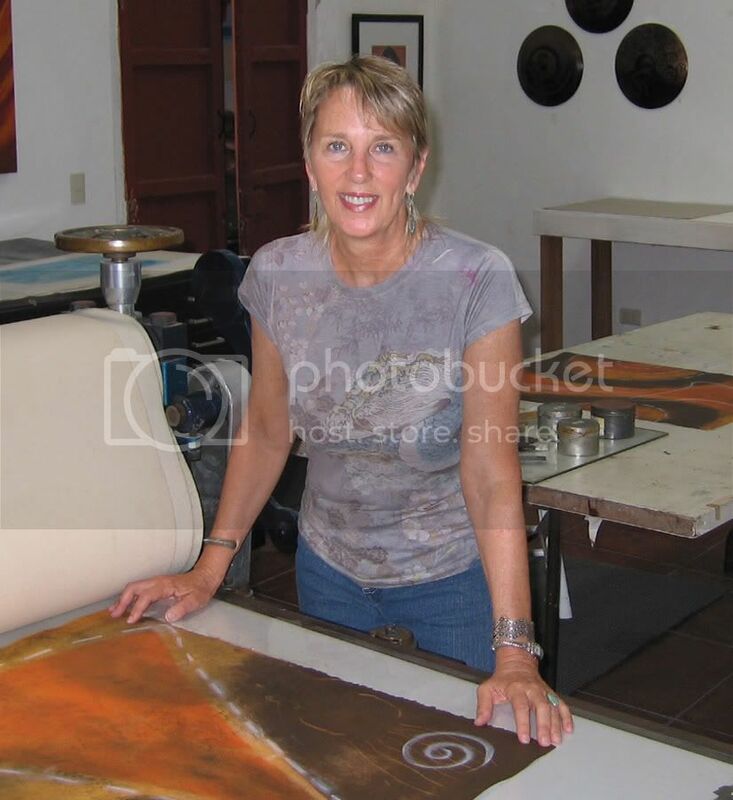 This year the group of eight featured CSP member Maryly Snow, as well as three artists who had never before made prints. Glen is a generous, experienced printmaker, and tailored her instruction and facilitation to meet the needs of every printmaker in the group. Basic monotype was covered, as well as some image transfer, drypoint and multiple drop printing. The operation of the studio was flawless, with the magnificent Griffin cranking out inspired prints, one after another. 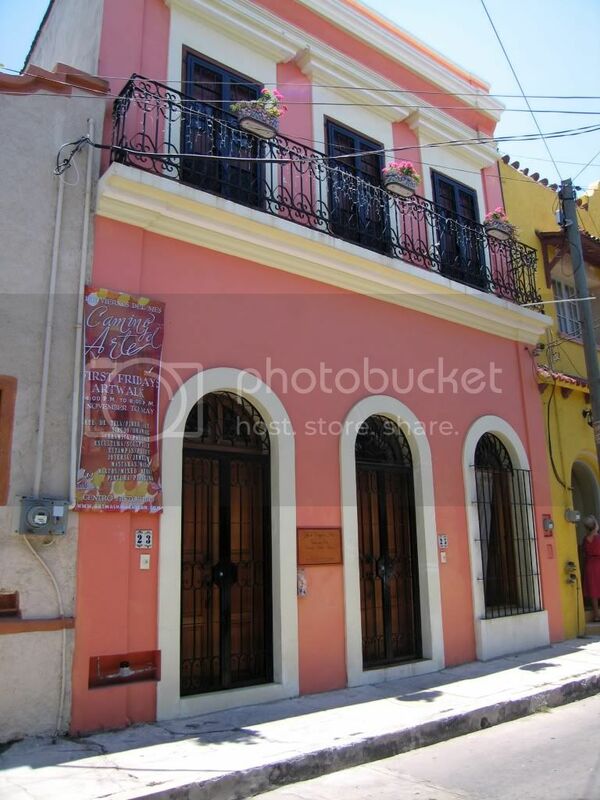 Glen Roger’s Studio is located in the Centro Historico district of Mazatlán. Blocks from the charming, 1950’s-like beachfront, it is 7 miles away from the spring break infested “Golden Zone”. The Centro Historico boasts gorgeous colonial architecture, a magnificent cathedral, many museums, two charming plazas and a bustling marketplace. It features a vibrant ex-patriot community of Norte Americanos, with many cultural activities, Wi-Fi and purified water in all establishments. There are many artists in Mazatlán, and the newly established First Fridays Artwalk, which Glen organizes, is extremely popular. During our trip, the Museo de Arte de Mazatlán, was featuring “Hecho in Mazatlán /Made in Mazatlán”. This strong and diverse international group exhibition showcases prints from the studio and workshops of Glen Rogers. Prints by many CSP members, as well as Mexican artists were included in the show, and it was a treat for us to see our work and the work of our colleagues in such good company. The author, Robynn Smith, pulling a print. Printmaking is powerful stuff, and through printmaking, Glen Rogers is making a transformative contribution to her newly adopted community. Artists are collaborating on projects, sharing information and creating opportunities for one another. As we were leaving, Glen was preparing for 5 artists from Bluseed Studios, Saranac Lake, NY to arrive for a week of printing and an exchange exhibition. 5 artists from Mazatlán will go there in July. Both of my Mazatlán printmaking trips were highly productive and motivating, while affording me the opportunity to experience another language and culture. I highly recommend Mazatlán as an interesting, charming city, and Glen Roger’s studio as a terrific place to make prints. The group at the press. More information on Monotype in Mazatlán is available at Glen’s website. Our affordable, well located and very comfortable accommodations were provided by Jim and Candace Penn at the Mazatlán Ocean Front Inn. More pictures from this trip can be viewed here.